While enjoying breakfast in a local restaurant on the street in Battambang, Cambodia, I captured a wonderful moment that highlights some of the contradictions of tourism. Two tourists, sitting in the comfortable posture of the lounge chair attached to the front of a sightseeing tricycle, passed by. Each wore dark sunglasses and large white headphones. They stare ahead watching the streetscape unfold to the personalized audio soundtrack of narration or music. They are in the city and yet distinctly apart from it—both on the street and yet plainly insulated from it. They are clearly present and yet not entirely. Behind the tourists, obscured from view, the raw physical labor of the local worker powers their journey. The workers too are both present and absent, but in a different way. They are from the place and yet not a fitting subject of tourism—there and yet obscured by face masks, large-brimmed hats and bicycle design. The workers provide power but little direction. 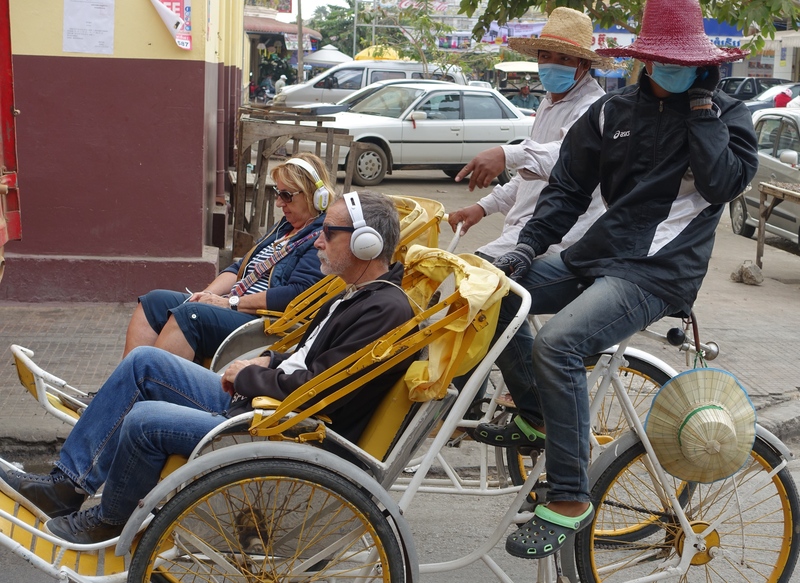 Upon returning home from their trip, when the tourists tell their friends they visited Battambang, what will the nature of their presence have been? Upon returning home in the evening, when the workers tell their family how their day went, what will they say about the tourists he drove around all day? For me, however, the punctium of this photo is the worker making a call on his mobile telephone. While physically there, he is also already somewhere else away from his labor—perhaps taking a all from a friend? Perhaps he is making important plans for the evening? Perhaps he is already telling his family about the uncanny watchers he is driving around town at that very moment.